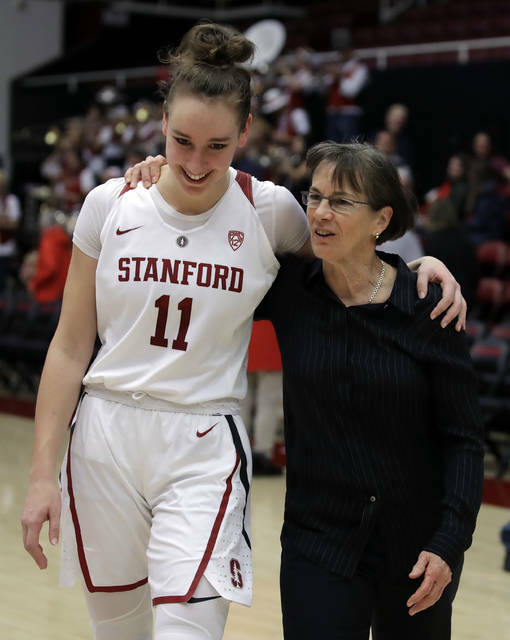 NEW YORK (AP) — Stanford’s Alana Smith picked a great game to have a career day. She scored a career-high 34 points on Sunday in a 21-point win over Washington. More importantly, she helped organize that contest to be the school’s first Human Trafficking Awareness Game. Smith took a class last quarter on human trafficking and Betty Ann Hagenau, Stanford’s public address announcer who works in the anti-trafficking field, spoke as a guest lecturer. They discussed doing more. STELLAR FRESHMAN: Texas Tech’s Chrislyn Carr is averaging 19.5 points per game, which is second in the conference. Carr would be just the fourth Big 12 freshman to ever rank in the top-5 in league scoring. The other three were Baylor’s Brittney Griner (2009-10, 18.4 ppg, 3rd), Oklahoma’s Courtney Paris (2005-06, 21.9, 2nd) and Missouri’s Julie Helm (1996-97, 17.0 ppg, 5th). TIP-INS: Baylor has won a Big 12 record 29 consecutive league games on the road since Jan. 6, 2016. The Lady Bears’ streak is tied for fifth all-time in the nation since 1999-2000. The streak is the second-longest active streak behind UConn’s 46 games. The all-time record of 48 (since 1999-00) is held by Stanford (Jan. 22, 2009-Feb. 7, 2014). … Redshirt junior Haley Gorecki became the second-quickest Duke player in school history to reach 250 points, 100 rebounds, 50 assists and 50 steals in a season, accomplishing it in only 17 games. She missed the mark by one game as Blue Devil all-time leading scorer Alana Beard accomplished the mark in only 16 games back in 2001-02. … Rutgers is 7-0 in conference play for the first time since 2007-08 when the Scarlet Knights were still in the Big East. TOP 25 CRASH: With conference play in full swing the AP Top 25 had a rough week. While the first eight teams didn’t lose a game, although No. 8 N.C. State needed OT to beat Virginia Tech Sunday, the rest of the poll went 18-16. COME FLY WITH ME: Saint Joseph’s women’s basketball team had a pleasant surprise waiting for them when they chartered a flight to Pittsburgh on Tuesday. The plane at Atlantic Aviation was one used by musician Stevie Van Zandt on his recent tour . Most of the players were too young to know Van Zandt from his days on the hit TV show the Sopranos as Silvio Dante. Van Zandt saw the team’s tweet about using his plane and responded. SLUMPING: Tennessee lost its fourth game in a row, falling to Alabama this week. The Lady Vols hadn’t lost four straight since 1970 — four years before Pat Summitt took over the program. The team will try and end the skid on Monday against Arkansas. No. 1 Notre Dame visits on Thursday.